Has anyone told you there are more ways to give than writing a cheque? The Anglican Foundation is here to help. The Anglican Foundation of Canada (AFC) has announced $305,000 in grants in support of new projects across Canada in its November cycle of awards. Warning! May contain inspiring and uplifting stories of your donations at work. Reader discretion is advised. 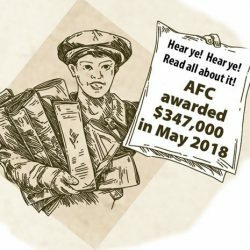 AFC awarded $347,000 in May 2018. AFC Board of Directors meets in Quebec City and awards $347,000 in April grant cycle. Welcome new Treasurer, Audit Committee Chair, and Board Directors in May 2018. Canadian Anglicans are making a difference every day!